Final leg of the journey…and mixed feelings to go with it. I have been ready to go home and a little weary of being constantly on the move, but as the time to go home gets closer the feeling is bittersweet. Knowing that there are only a few trip experiences left definitely make me want to enjoy them fully! We left Vancouver behind yesterday morning. We checked out of the Westin at 5am, saying goodbye to a very comfy bed in room 808 (thanks Dad – the luxury element was much appreciated!) and caught a flight north to Prince Rupert. 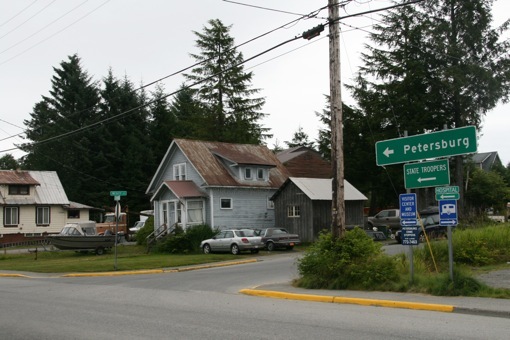 This little town still Canada, but pretty much borders South East Alaska. The weather here was decidedly Irish – overcast, threatening to rain/clear up at any given moment. We had a few hours to wander around. In Rain restaurant, where we filled up on a hearty brunch, we were sure we spotted Michael Stipe brunching with his girlfriend & her parents….Cathal went to shake his hand, but we are still not totally sure if it was him. Either an amazing “celeb sighting” or some guy is laughing his head off at being mistaken for the REM frontman. After a wander around the museum of First Nation artefacts & totem poles, it was time to catch the Alaskan Marine Highway Ferry (OK just “the ferry” from now on!). 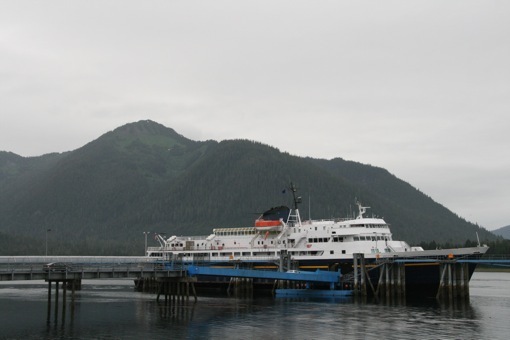 The ferry is to be our main transport around South East Alaska, where we are spending the next three weeks. There is an extensive network of routes, necessary in a land of few roads. 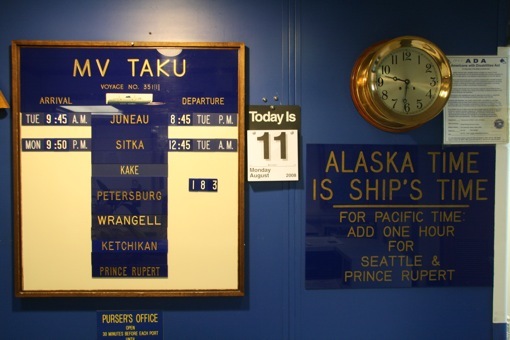 The first 32-hour or so leg took us from Prince Rupert to Sitka. We made several stops in small towns. There was a timely stop last night at Ketchican, just in time to have a pint of Kona Longboard & catch Michael Phelps win his second gold in the men’s freestyle relay – narrowly beating the French. This morning we stopped at Petersburg, the Paris of the North. Here we sampled Emily’s Cafe’s fantastic cinnamon rolls – beats porridge any day! I must mention that we are camping on deck. 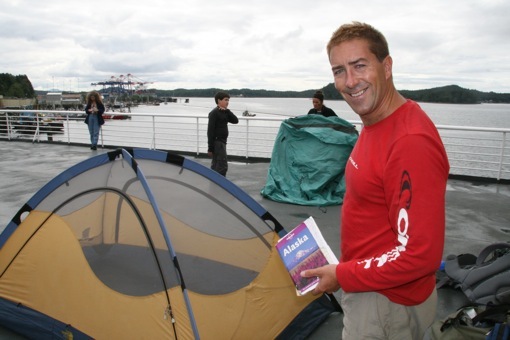 This is something Cathal spotted in Outside magazine a few years ago – the hardy folk eschewing a cabin to pitch the tent and sleep on deck. We pitched last night beside two neighbours, and had a surprisingly sound nights sleep! Enjoy the last leg of your journey. I can’t believe that’s it’s nearly a year since you both got married and set off on your year long trip. You’ve both certainly packed a lot into the year. Looking forward to seeing you both when you get back.